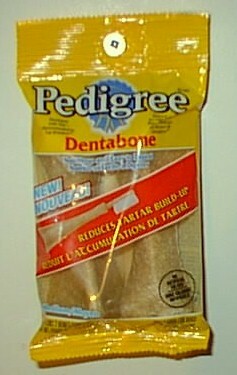 The Pedigree DentaboneTM is designed for cleaning a dogs teeth, and controlling tartar, so they're extremely hard. When I first saw them in the grocery store I wasn't sure if they were worth $3.50, but I bought a package anyway. Troy's reaction to them left no doubt - they're more than worth it! He absolutely loves them, and goes through one in about two weeks. My neice's rat, Buddy thinks they're great, too. They only last him about one week. The only sizes I've found are Medium and Large. Considering the Medium is about 4 inches (10 cm) long I would prefer the Small. I haven't been able to find a store that carries the small size, though. One thing I have found is that the price of a two-pack varies widely, so it pays to shop around. The cheapest I've found them is at PetSmart, with WalMart being the runner up. The DentaboneTM has a higher protein content than I'd prefer (MIN. 17.0%), but Troy has shown no sign of a protein reaction. Since it takes him so long to eat one, the amount of protein added to his diet must be too little to bother him. I've been giving him DentaboneTM for more than two months now, so I'm sure he would have shown a reaction if he was going to. The primary ingredients are rice, and rice flour with various binding agents. All in all, I find this product is very good. Rats seem to love it, and it does a terrific job of keeping their teeth worn down. I would definitely recommend it.